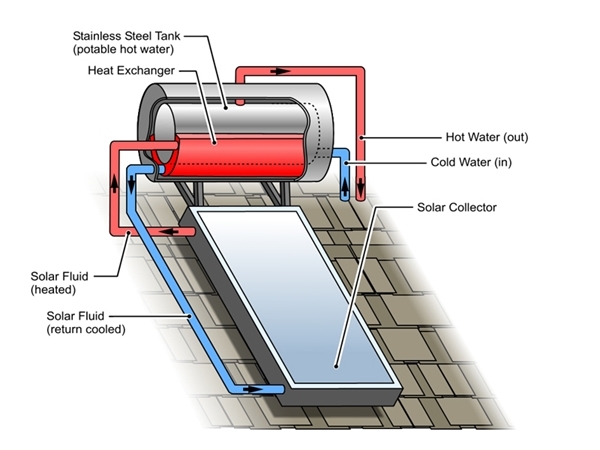 How solar hot water collectors work. There are a number of types of solar heat collecting systems, but for water heating we are concerned with a tried and proven system called flat plate collectors. Firstly though, let’s distinguish between solar electric (photovoltaic) modules which convert sunlight into electricity; solar pool heating panels, which are designed to raise a large mass of water a few degrees; and flat plate collector panels, which are designed to raise a smaller amount of water (say 250 to 400 litres) to useable hot water temperatures (of about 70 degrees Celsius). The best solar panels are made from quality components which include: copper pipes and flat copper plate; an “AMCRO” selective surface (which absorbs 95% of the available solar energy); and low iron glass (which improves solar acceptance by about 10%). A suitable north facing mounting spot must be found for the solar panels. Generally this will be on the roof, but they may be located on a wall over a north-facing window, on a deck or even on the ground. Ideally the solar panels need to be as close as possible to, but below the storage tank.